All this wet weather has had a negative impact on our cycling. Even going for a ride when it hasn’t been raining has met with puddles and wet mud, so the bike and clothes invariably gets covered in cack – and much as I like to keep the bike running well, having to do a proper clean after every road ride, just isn’t nice. 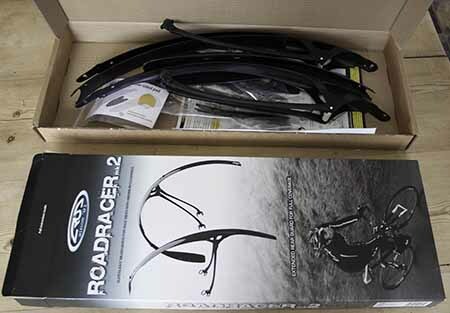 So, despite a previous poor experience trying to fit thin mudguards to the Cannondale, the Road.CC review of the Mark 2 Crud Roadracer mudguards sounded quite positive… so in keeping with the Mombee ethos, I’ve stumped up the money and they’ve just arrived from Chain Reaction. First impressions are of a box of lots of well-pressed blastic plastic parts, so I’m hopeful that this quality makes the fitting easier… I’ll report back later.